As many of you will be aware, I am currently travelling. We had a few weeks of camping, and we’re now coming to the end of our month in Europe. A fortnight before we were due to be in Paris, my darling suggested, out of nowhere, that we look into a French cooking class. Clearly, this was an inspired idea. After a bit of googling we found Le Foodist, which had exceptional online reviews and which had spots available for our last night in the city. We decided not to book for the market bit at the start, because we figured there wasn’t much point when we were leaving 12 hours later, and becuase we thought we might want more time doing museum-y sorts of things. Our menu consisted of cauliflower soup, coq au vin, and peach Melba (which as an Australian I found hilarious). Our class of twelve was divided into different working groups at different times to do a range of prep. While doing so we tried different French white wine and two different Bries. We ate everything that we prepared. Cauliflower soup doesn’t sound all that exciting. 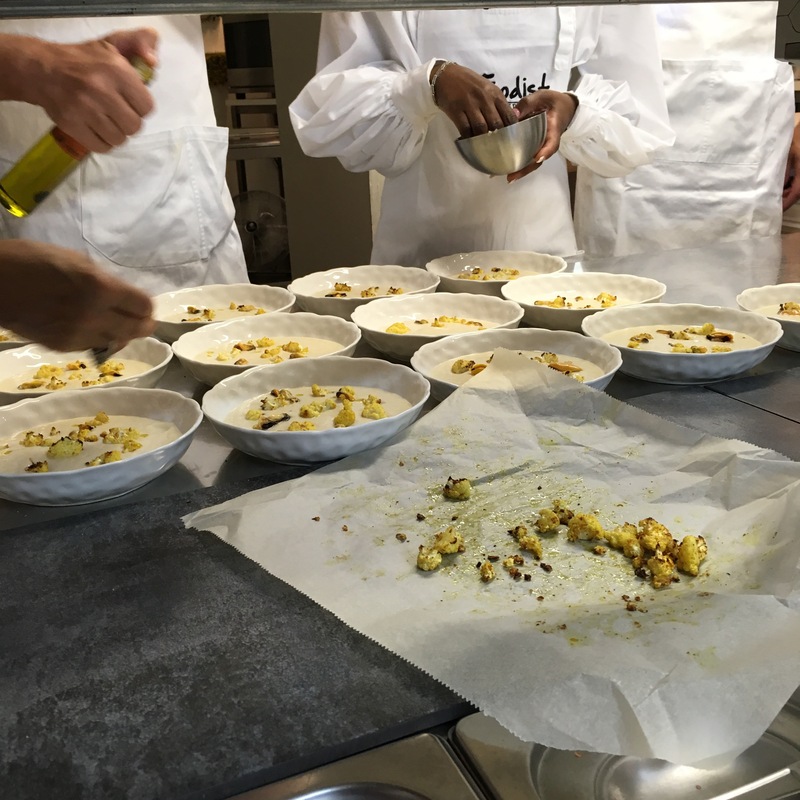 This cauliflower soup, though, was topped with roasted cauliflower florets that had been brushed with curry powder; with boiled mussels – whose broth was added to the soup; and with dots of truffle oil. (I have to get me some truffle oil.) It was exquisite. Coq au vin is something I have heard of, and may have eaten once or twice, but I haven’t made it. Making the sauce was a fascinating exercise: using a vegetable base and a large quantity of red wine which reduced to nothing, and then adding stock to turn it back into a sauce. Cooking the chicken was the most interesting part: salt and pepper on the chicken breast then rolling it up with plastic film into a sausage, and then boiling it for five minutes and resting for another five. It was delicious and succulent and this method is going straight to my must-repeat list. For the vegetables, we were introduced to not-melon-ballers: small spoon-like instruments with rounded ends that have a fancy name in French and come in a variety of sizes. These are used to carve balls from things like carrot and turnip. We were introduced to the sensible way to finely chop thinks like shallots. And we were shown how to make the best potato mash ever, which involved a fine sieve and a very large amount of butter. 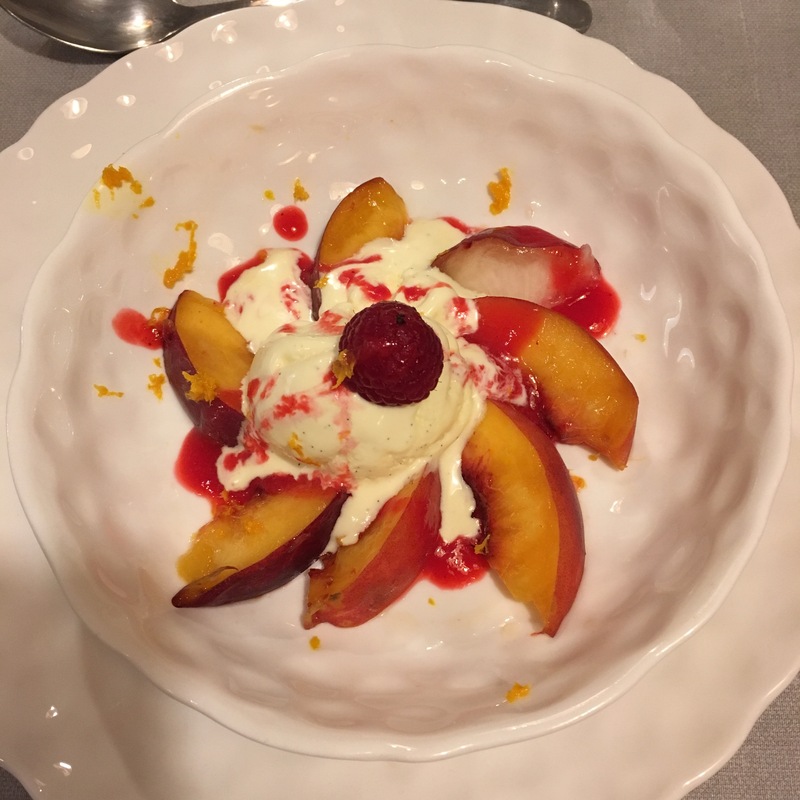 For dessert, we made raspberry cousli and creme anglais, which then became ice cream, served with delightfully fresh peaches. It was a very simple dessert which was a good accompaniment to the fairly rich main meal. Our teacher, Fred, was excellent. He was good at dividing us into groups and showing us a variety of cooking techniques. He is passionate about food and French culture (the tag line of Le Foodist is “discovering culture through food”), and sharing his knowledge about food, the regionality of food, about Paris, and tricks for making food work. The premises aren’t huge, but there was enough space for the dozen of us to cut and stir without chopping anyone’s fingers off. Highly recommended. 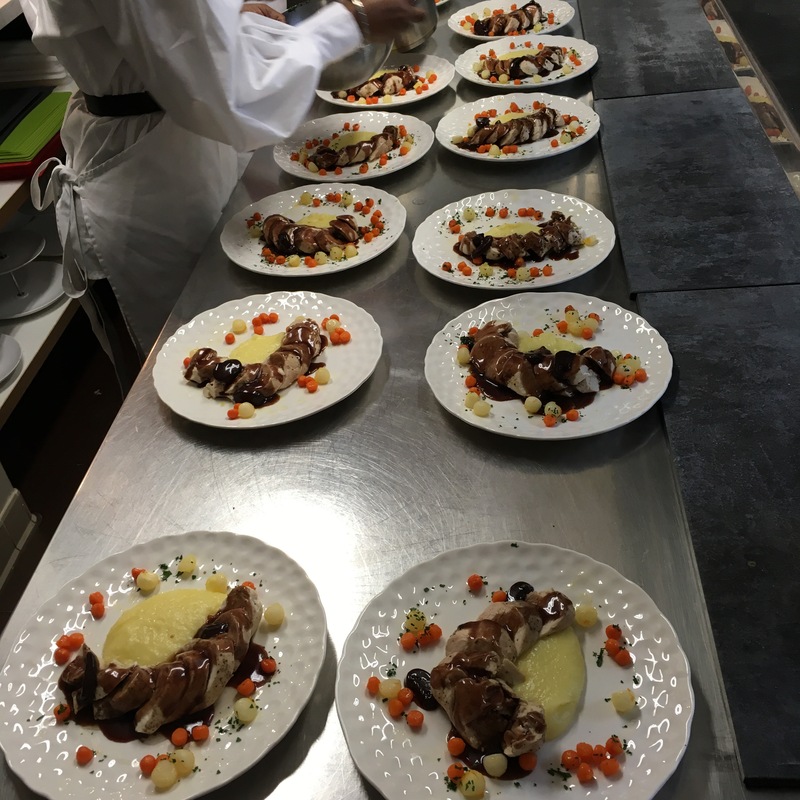 I absolutely intend to make chicken in this way when I am home; at some stage I would like to recreate the “au vin” part of the recipe too. I’m inspired to make cauliflower soup that really works – it gives me a reason to plant them again, too. This book was sent to me by the publisher. Go here for discussion of the physical product. There’s some nice basics in here: harissa, watercress pesto (which I used to make snow pea pesto, and it was quite good), labneh and tapenade. I have prepared the cured lemons – one thing I do not lack is lemons – which the book promises will eliminate a “bleach-y taste” they claim preserved lemons carry. I haven’t noticed. I haven’t turned them into cured lemon paste, yet, but I definitely plan to. These things are in “The meal before the meal,” along with other dips and felafel and such. The next section is “Raw beginnings” and I haven’t made anything from this section… and I’m not likely to. I’m allergic to scallops so that’s a few recipes gone, and I’m just not the sort of person who will ever come to steak tartare. There are one or two salads that might get a look at. I have mostly cooked from “The main act.” The book has two shakshuka recipes; I’ve made the “New style” one with cauliflower, zucchini, garlic and chilli and coriander – then eggs cracked over. It was ok – I was perfectly happy to eat it – but not completely brilliant. It was one I had altered, taking out the eggplant because my beloved isn’t a huge fan… but since the recipe has a section called “Variations,” telling you to “reinvent” it every time, this shouldn’t have been a problem. I am intrigued with making it with chorizo and/or olives, feta… or, they promise, “any old stew or cooked vegetable you have as leftovers from yesterday’s main meal.” So I’m not quite giving up on this. Polenta Jerusalem style: I admit I used instant polenta, which the author of the book would abhor, but that’s what I have. This involves making polenta; putting “mushroom ragout” on top (mushrooms cooked in butter), and then blanched asparagus. Garnish with Parmesan. I mean yes, it was tasty, but it’s not all that miraculous. Maybe ‘real’ polenta makes a huge difference? Papi’s spinach gnocchi: was a disaster. I’ll wear this one because I didn’t want to simmer them in goat’s yoghurt (too hard), so I simmered them in water instead. They just fell apart. I didn’t drain the spinach enough? Who knows. Right in the middle there’s a series of pictures showing octopus – both cut up and not cut up. It’s my least favourite part of the book. Cod chraymeh: I didn’t use cod, because that’s too hard in Australia; I think I used ling. This was … well, not flavourless, but really not worth the effort. It has red capsicum, garlic, spices, harissa… I was surprised how much it didn’t work. Chicken thighs in green olive and tomato sauce: this was quite nice – the chicken with the olives worked really well. Verdict: I’m not sad to have experimented with it, but I wouldn’t be rushing out to buy it for all my friends. Possibly I’m spoiled by Jerusalem plus my two Sabrina Ghayour books, and The Saffron Tales, which basically cover these sorts of recipes – the ones I’ve enjoyed anyway. That said, I am looking forward to trying the date roulade, and their version of pitta bread. This book was sent to me by the publisher, Allen&Unwin, at no cost. The RRP is $39.99 and it’s available from today (May 25). My darling isn’t a huge fan of basil pesto, as a rule, so I was curious to see how he felt about this one. It’s made with the inner celery leaves (the yellowy ones), parsley, capers, pine nuts and pecorino (I used parmesan) plus the other normal pesto bits. And the answer was that he really liked it – as did I. It’s a lot subtler than basil pesto (which I do love), but still very tasty. This recipe puts the pesto with boiled potatoes and inner celery stems. I served it with those and chicken, and ate the leftover chicken with leftover pesto the next day. Very nice. First change: no fresh dates, so used dried ones. Anyway – cauliflower with cumin and coriander and garam masala, baked; always lovely. Cook onion and add chickpeas, then throw those on top of the cauli and add the tahini which you’ve mixed with orange juice and zest and a bit of sweet. I served this by itself but would definitely make it again to serve with other salads. Very tasty and I enjoyed the mouthfeel of cauli with tahini. I suspect this may become a favourite pairing. Look, it’s fair to say that this recipe caused some anguish. This is probably largely on me, because Blereau’s recipe calls for shortcrust pastry to be made from spelt and barley flour, but the two places I tried – the supermarket (I live in a hipster and immigrant area, so it’s not that ridiculous) and a bulk-food place – did not have barley flour. So I subbed in ordinary flour. I did not do the research into whether or how barley flour deals differently with butter compared with ordinary flour. The pastry was very short and I found it very difficult to deal with. There might have been some shouting. Still, with the soothing hands of my beloved we did end up making them, and they were tasty enough; it seemed like a lot of butter, because they went very crispy. The filling was ok – roasted pumpkin with coriander, cumin, and fennel. Again, neither of the places I checked had green split peas. The supermarket had a spot for them, but they were out of stock. So I used a normal soup mix. This is a very nice soup but it’s not anything out of the ordinary. I think I’ve made polenta maybe once, and that was to cut it up into squares and bake it (which was nice). This recipe recommends cooking the polenta in a fatty stock, and I realised that I had a lamb ‘stock’ in the freezer from ages ago – I think it was liquid I drained off some dish and couldn’t bear to throw. So I used that to cook the polenta, and it was delicious. The refried black beans were also really nice, with capsicum and coriander and a little too much chilli for my tastes (c/ beloved being a little heavy handed). We didn’t add the corn to this because we’re not huge fans; I didn’t think the dish suffered for its lack. I ignored most of the section on ‘basics’, like using kefir grains in… stuff… and preparing and cooking beans, lentils, and grains. It’s a well presented book, as you’d expect from Allen&Unwin; it’s one of those big cookbooks, with what feels like a solid spine, and generally appetising photos throughout. Each recipe has dietary info about whether it’s dairy or gluten free, vego or vegan, and other allergy stuff. However the recipes, while nicely set out on the page, sacrifice font size in favour of white space, which makes reading from a distance something of a struggle – not great from the other side of the stove. I have two main issues with the book. One is perhaps obvious from comments above: there are ingredients in here that were not easy for me to find. I do not know what kombucha or kefir grains are, nor where to find them. I live near the city, in a hipster area. Probably I could find these things, and I know I could find them online, but the point remains that this is not an easy, automatic book to cook from – and that’s not acknowledged anywhere, as far as I could find. Connected to this is the reality that this is not a book for the economically poor, nor the time poor. This is not necessarily a problem, if you’re buying for yourself and willing to put in the time and money, but it is something that should be acknowledged. Blereau is all in for pre-soaking beans and grains and then cooking for however long, so you need to be prepared for that if you want to follow the recipes precisely. And of course being prepared for the time it takes to make cultured cream and so on with your kefir grains. In the end, I think that this book has some interesting recipes in it, but if you’re not completely on board with wholefoods you might find it more annoying than not. That said, if you ARE into wholefoods (which is totally fine I would just rather have a more scientific discussion about it), this may well be the book for you, especially if you’re just starting out and are interested in exploring different sorts of grains and how to actually use them in meals.